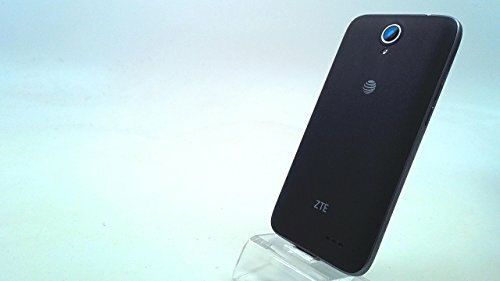 You are getting an AT&T Prepaid ZTE Maven 3 4G LTE Smartphone Cell Phone, Black, with Unlimited Calling, Texting, Data. 5″ Touchscreen, 8GB Internal Memory, Android Nougat 7.1.1, 5MP Rear-Facing Camera, 2MP Front Camera. Model: Z835PAYGO. The ZTE Maven 3 AT&T PREPAID is a sleek and lightweight 5″ LTE smartphone running Android Nougat OS with a vivid display, front and rear camera and FM radio at an affordable price. With a quad-core processor and the Android Nougat operating system, you get fast access to apps and websites without sacrificing on performance. And with 8GB memory and up to 32GB expandable storage, there’s plenty of room for photos and music. Features: >>> NO ANNUAL CONTRACT. NO CREDIT CHECK. All on the nation’s best data network. Flexibility, great service, and reliability that exceeds 99-percent. AT&T PREPAID covers 99-percent of all Americans. >>> 4G LTE speed. Provides fast Web connection for downloading apps, streaming content, and staying connected with social media. >>> 5″ FWVGA touch screen. Large, clear screen lets you browse apps, view photos, and watch videos in crisp detail. >>> 5.0MP auto-focus with LED flash camera and 4X digital zoom. 2MP front camera. Capture images while you’re out and about. Easily take selfies and panoramic photos with the front-facing camera. You can also take HD videos in 720P / 1080P. >>> Up to 8GB internal memory plus microSD slot. Provides plenty of storage space for your contacts, music, photos, apps, and more. Expand storage up to 32GB by adding a microSD card (sold separately). >>> Processor: Chipset: Qualcomm Snapdragon 210. Cores: Quad-core, 4 @1.1GHz. >>> Size: 5.73 x 2.85 x 0.39 inches. Weight: 5.53 ounces. >>> Made by AT&T. UPC Code: 885913105505. For use with AT&T Prepaid. >>> 30 DAY GUARANTEE. Go ahead and order now. There is zero risk for you. Your purchase is backed by Amazon.com’s 30 Day Guarantee. “Items shipped from Amazon.com can be returned within 30 days of receipt of shipment in most cases.”NO ANNUAL CONTRACT. NO CREDIT CHECK. All on the nation’s best data network. Flexibility, great service, and reliability that exceeds 99%. AT&T PREPAID covers 99% of all Americans. 4G LTE speed. Provides fast Web connection for downloading apps, streaming content, and staying connected with social media. 5″ FWVGA touch screen, scratch resistant display. Vibrant, large, clear screen that’s also scratch resistant lets you browse apps, view photos, and watch videos in crisp detail. 5.0MP auto-focus with LED flash camera and 4X digital zoom. 2MP front camera. Capture images while you’re out and about. Easily take selfies and panoramic photos with the front-facing camera. You can also take HD videos in 720P / 1080P.